This beautifully carved and brightly coloured roof boss, to be found in the easternmost bay of the South Quire Aisle, depicts one of St George’s Chapel’s most famous relics, the Cross Gneth.Kneeling on either side of this Celtic cross are King Edward IV and Richard Beauchamp, Bishop of Salisbury, 1450-1481, Dean of Windsor, 1478-1481, and Chancellor of the Order of the Garter, 1475-1481. The scene deserves an explanation. The origins of the Cross Gneth, also known as the Croes Naid, remain obscure. It was a reliquary containing a piece of wood believed to be from the True Cross on which Christ had died. It may have derived its name from a priest, Neotus, who supposedly brought the piece of the True Cross to Wales. Held in great veneration by the Welsh, it became a national talisman, remaining in the custody of the Princes of Wales for several centuries until its removal to England by Edward I in 1283 after the defeat and death of Prince Llewelyn. Edward I regarded the relic as his own personal property, taking it with him on triumphal progresses through England and Scotland. During the reign of his son, Edward II, it was lodged for safety in the Tower of London, where it remained until 1352, when it was given by Edward III to his newly founded College at Windsor. It was to prove an excellent source of income for the Dean and Canons, who benefited both from its prestige (it was accounted the ‘chief treasure’ of St George’s Chapel) and from offerings from the constant stream of pilgrims who came to Windsor to pray before the famous relic. 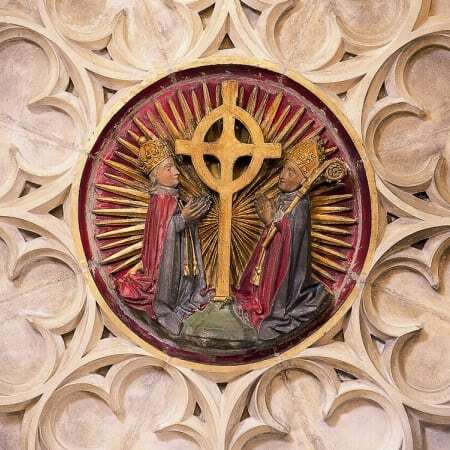 According to an inscription still visible below a niche in the South Quire Aisle, those who prayed ‘knelying in the presence of this holy Crosse’ would receive forty days of pardon from the Church. But why do Edward IV and Richard Beauchamp feature on the boss in the South Quire Aisle? It was Edward I not Edward IV who acquired the cross from Wales and Edward III who donated it to St George’s. The answer lies in the building itself. On the construction of the new St George’s Chapel in the fifteenth century, the boss was installed (in about 1480) as part of the vaulting above the altar and shrine dedicated to the Cross Gneth, which was to be moved there from the old Chapel to the east. What better way could the King, who commissioned the new Chapel, and the Bishop of Salisbury who as Master and Surveyor of the Chapel oversaw its construction, be celebrated in stone? But what of the relic itself? It remained at Windsor until 1552 when it was confiscated by Edward VI’s Commissioners, along with the Chapel’s other relics and treasures, which seem to have ended up in the Tower of London ‘awaiting the King’s further instructions’. * The ultimate fate of the cross itself remains uncertain. However, the Chapel contains two representations of the Cross Gneth – the boss featured above as the ‘Image of the Month’ and a further roof boss in the Nave .